Be sure to check out Highlighting Our Vendors, Part I if you missed it! We didn't start looking for a baker until after the open house at our venue at the beginning of January. There was a baker there with a number of absolutely stunning cakes, but he said he was booked for the week of our wedding and referred us to another baker. We contacted her and she, too, said she was booked and wouldn't be able to do our wedding and referred us to two different bakers. In the end, we ended up contacting six bakers from a web of referrals that started with the one we met at the open house and only three of them were still available that week. I tentatively booked appointments with three of the bakers, but two of them wanted a £20 tasting fee. The fee would go toward our cake if we ordered from them, but was non-refundable if you decided not to order with them. I have mixed feelings about that. I understand why they do it, but it also make me really hesitant to follow through with booking a tasting, especially after discovering the third baker would do a free consultation and tasting. Meanwhile, Luke wanted to try a cake from what's considered a higher end grocery store. They offer small tasting cakes for less than £10. He ordered one and we picked it up before heading to the cinema and attempted to eat it in the dark as our movie snack. It didn't go well. One, the icing was really solid and chewy. It seemed to be fondant, but it wasn't supposed to be and it was dark, so we couldn't really tell. The cake seemed to be quite dry unfortunately, but had some sort of ganache filling. Neither of us really liked it, so it was easy to rule it out as an option. A few days later, we had our appointment at Amerton Cakes. Our plan was that if we didn't like their cake (or their pricing) we would follow up with the other two bakers and go ahead and book and pay for those tastings. If we wanted to go with Amerton, it was no love and definitely no money lost. The bakery was tucked away in a large group of businesses at Amerton Farm Craft Centre, along with a butcher, a bakery, and a few other businesses. It looked like it was a really cool place to hang out, but it was cold and the sky couldn't decided between rain and snow, so it was quite deserted outside. When we went into the bakery, though, I was in heaven. Their space was absolutely beautiful! Their entire upstairs was a mix between a show room, and office, and a tasting room. Everything was copper and white and twinkling and soft and I was just in heaven. We were able to choose 6 flavours to try at the tasting and when we got there, Lucy, one of the owners, had surprised us by adding a seventh flavour that they were just introducing. We opted to try chocolate, vanilla, red velvet, salted caramel, cookies & cream, strawberries & champagne, and they added peach & prosecco. They were all really delicious, but in the end we chose red velvet. We thought we would go with chocolate with vanilla buttercream, but I'm kind of not surprised we chose red velvet. It's been my favourite flavor cake for my entire life! Besides, I made a chocolate cake from Sally's Baking Addiction for our marriage ceremony in September, so we needed a little variety. They had an offer that weekend that gave us 10% off if we booked that weekend, so we went ahead and booked with them. We were amazed by their designs and blown away by their service and personal touches. We were able to talk with Lucy about mix and matching some of their previous designs since we weren't entirely sure what we wanted it to look like before our meeting. When we saw what they could do, it was a fairly easy choice. Our cake was exactly how we pictured it and tasted amazing. The florist added the greenery and a few paper flowers to finish the look. While cutting it, we agreed there would be no feeding each other, no shoving the cake in each other's faces, etc. I didn't want to get red velvet cake on my dress, but actually had spilled red wine on my dress just before the toasts started. Whoops! Our DJ, Benny Smyth, came highly recommended by the venue, as well as one of the employees who had used him at her own wedding. We first met him at the Open House and he and Luke instantly hit it off because they were wearing the same shirt! Hiring a DJ was what I was most nervous about because I didn't think we would get a chance to hear him play--which we didn't--but he was absolutely fantastic. We had one consultation with him that ended up taking place via Skype since it was during one of the few blizzards we had this winter. We told him what we were looking for and gave him a list of songs that would be a part of our day, including the ceremony and the dances. Later, we emailed him a list of about a dozen songs to build a playlist around. He killed it! The way he transformed the space into a great party and read the room really well. He played the songs we asked for, but also played a lot of disco and oldies (yes!) and later more hip hop. It had a great flow to it. Apparently two different guests requested the Wobble, which he didn't have, and one of them said "Well, the bride wants a little bump and grind." He ended up taking that literally and played Bump N Grind as the last song of the night. My favourite thing that he did though was replay our first dance song as the penultimate song. That was, of course, such a special moment for us and no one else danced during it (which was what I wanted), so it was really fun to be able to relive that and for our guests to get a slow dance as well. The guests spoke really highly of Benny during and after the wedding and seemed to have a great time. There were even a few guests who barely even left the dance floor! The dresses, both mine and the wedding party's, were probably the easiest thing for me. I knew exactly what I wanted and got both of them sorted really early on in the planning process. (Though, that did make me nervous that I might not like the dresses by the time the wedding came around 15 months later.) I had a really clear vision of what I wanted my dress to look like between the illusion back--or backless--and lace. Spoiler alert: It's what I ended up with! I thought it would be good to start at David's Bridal, thinking they would have a good variety so I could try on different styles and fabrics, but I didn't really love anything there. I don't know if the attendant wasn't listening to me or if she was just doing the best with what she had, but I just didn't really love anything. I did actually end up putting a dress on layaway, but now I'm really glad I didn't get it, even though it was on sale for $300, because it could have easily been one of the bridesmaids' dresses if it had been pink! As for the rest of my look, I wanted to keep things simple. I wore Luke's grandmother's moonstone necklace, which I've actually worn every day since I was given it after we got engaged, as my something old. I paired that with small yellow gold studs, my something borrowed from my mom. I used to not wear yellow gold jewellery, but I loved the mixed metals I had on the day of with my engagement ring being white gold and my wedding band being rose gold. And it was nice that that is actually the jewellery I wear every day. My something new was my shoes, which I got last spring. I wanted something comfortable that would fully embrace my style and add a pop of colour. I found suede oxfords from Hobes last spring and have been dying to wear them ever since! They were great throughout the whole day and added absolutely no height, which made me happy. My veil was a simple fingertip tulle veil with a beaded edge, which added a little sparkle to my outfit. I took it off after post-ceremony photos, but it was easy enough to put back on for more portraits with Luke later in the evening. Very early on, I knew that I wanted the bridesmaids to wear different styles and colours. It was important to me that each woman wore something she felt comfortable in and something she liked. I quickly found Weddington Way and it was exactly what I wanted. I got colour swatches from them in champagne, blush, and dusty rose, as well as gold and rose gold in their sequinned fabric for the ladies to choose from, though obviously none of them chose sequins. The swatches were great too because I used them to build the colour palette, rounding it out with grey and navy. To mirror the mix and match look on my side, we asked the groomsmen to just get a grey suit, so they're all a little different as well, but they're all wearing the same navy tie. (I totally forgot about a something blue, so it'll have to be Luke's tie.) 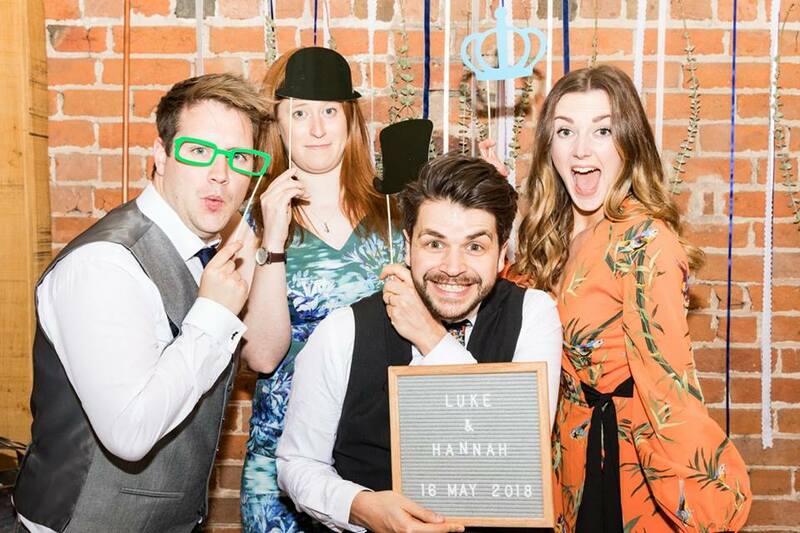 Luke's sister was his best man, so she got a grey dress from Weddington Way as well to tie in the guys' colour palette and the ladies' style. Sadly, Weddington Way is going through a big transition right now with Gap Inc pulling out of the company, so it's unclear if they'll even stay open as an online site. If they do though, I highly recommend them. Almost all of the dresses needed to be hemmed, but otherwise needed minimal tailoring. I also got my dad's tie from Weddington Way to match the blush perfectly. I only regret not thinking of asking my mom to make the guys pocket squares out of the scrap fabric after she hemmed them! For most of the wedding planning process, we weren't going to have a photo booth. It was honestly somewhere we thought we could cut corners, but ultimately I'm so glad we had a photo booth. It was a hit! We asked our friend Pete if he would be interested in setting up a simple photo booth for us since he's wanting to break into people photography. He did such a fantastic job and people had so much fun with the props (borrowed from our friends who got a set for their Royal Wedding themed joint birthday party). We made the backdrop with three copper pipes and added ribbons in our colours and eucalyptus to tie it in with the rest of the decor. The photos turned out great and when I shared them on Facebook, everyone was commenting, liking, and sharing their favourites. Pete has now set up a website where you can book his services if you're in the Birmingham area. My sister, Sam, is a fantastic hairstylist back in Colorado, so it was never a question who would be doing my hair and make up for the wedding. She was seriously the MVP of the wedding day since she did hair for six people before noon! I didn't spend too much time thinking about what I wanted my hair to look like on the day of, other than an up do to show off the back of my dress, but eventually just sent Sam a photo from Instagram I liked for her to use as inspiration. For my make up, all I knew was that I wanted something simple and natural looking and Sam did a great job at that. Since she lives in Colorado, we didn't get a chance to do a trial, but she did do my make up for my hen do (bachelorette party) mostly so we could see how long it took. She did such a fantastic job on everyone. She did six different styles that made everyone look beautiful and like themselves. My hair (and make up, actually) really held up well throughout the evening and I was actually able to sleep on it and wear it the same the next morning to a quick morning after shoot with Brianne and brunch with our families. Photo booth photos, including the header photo by by Peter Horrox Photography. All other photos by Brianne Haagenson Photography.